From the start, the international community’s reaction to the Ebola epidemic in Africa seemed destined to take a racist turn. The slow initial response to provide adequate medical and financial assistance to stop the spread of the disease in West Africa was not a good sign. 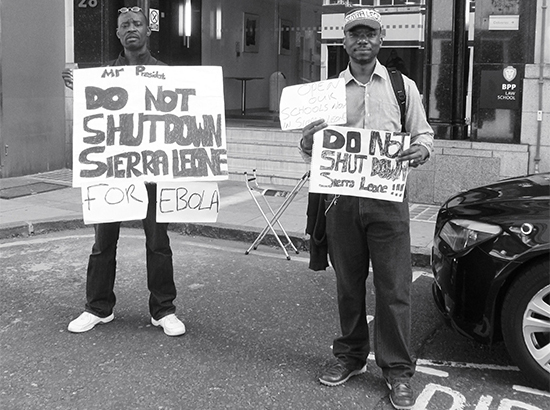 Ebola, undoubtedly, was viewed as Africa’s problem in the early days of the outbreak. When the United States recorded its first Ebola death earlier this month in Dallas, it triggered panic across the country. Now, instead of showing empathy, many Americans are using Ebola as an excuse to discriminate against those who hail from West Africa, especially the hard-hit countries of Sierra Leone, Guinea and Liberia. Two students from Nigeria were denied admission to a Texas community college, which cited the country’s “confirmed Ebola cases” in the students’ rejection letters, even though Nigeria has had its outbreak under control. Liberians, in some parts of the U.S., report being grilled at work and in public places about their health and social life. Some say they have been sent home from their jobs if they cough or have a cold, even though coughing is not a symptom of Ebola. The social pressure has been so great that a nurse in one Atlanta congregation quit her job, her pastor said. Some elected officials, meanwhile, have jumped at the chance to propose bans on travel from Ebola-stricken countries into the States, as if everyone coming from the affected areas poses a health threat to Americans. One doubts that the same proposals would be put forth if the stricken countries were in, say, Europe. In fact, measles cases transmitted by travelers from Europe and elsewhere have been reported to the federal Centers for Disease Control and Prevention over the years, but no one has pressed for travel bans from those countries. You could chalk up the panic to simple ignorance, but we’ve seen this attitude before. At the start of the AIDS epidemic, only one ethnicity was singled out by the CDC as a high-risk group for HIV/AIDS: Haitians. The designation of Haitians as a high-risk group, along with homosexuals, hemophiliacs and heroin users –- the so-called 4-H club -– fueled a wave of discrimination against people of Haitian descent, some of whom lost jobs, housing or admission to school. Some say that stigma remains to this day. It’s time for us to think more clearly. Public-health experts say travel restrictions serve only as a psychological Band-Aid and won’t stop the Ebola epidemic. Such rules would further marginalize Africans around the world and perhaps make the epidemic worse. Restrictions would make it harder to get much-need medical equipment, supplies and manpower to people in the affected countries, and could encourage some travelers from those countries to use other routes into the U.S. or withhold important information about their medical histories. Panic, on its own, is unhealthy. As we head into winter, there are practical reasons to push back against ignorance and fear about Ebola. Hysteria takes the focus away from public-health problems that pose real threats to Americans. Like influenza. Between 1976 and 2006, annual estimates of flu-associated deaths in the U. S. have ranged from a low of about 3,000 to a high of about 49,000 people, according to the CDC. About 200,000 people, on average, are hospitalized every year. Yet despite flu’s toll, many Americans still refuse to get a shot, even though doing so protects others who may be too young, too old or too ill to get vaccinated or fully benefit from immunization. With only one Ebola death and two confirmed transmissions in the U.S., that disease doesn’t come close to being as serious of a health risk to the average American as flu. Reasonable people should try to enlighten those who act out of fear, ignorance – and yes, racism. At the very least, we should resist blindly traveling the same shadowy roads we have stumbled down in the past; an ill-fated journey that can only cause already vulnerable people to experience unnecessary stigma, suffering and shame. Deborah is the managing editor at The Chicago Reporter. Email her at dshelton@chicagoreporter.com and follow her on Twitter @deborahlshelton.